It’s amazing what you can accomplish when you are removed from your home and don’t have all the normal distractions like cable TV with Netflix and pay-per-view, along with a handy washer/dryer and a couple of thousand square feet to (think about) cleaning. 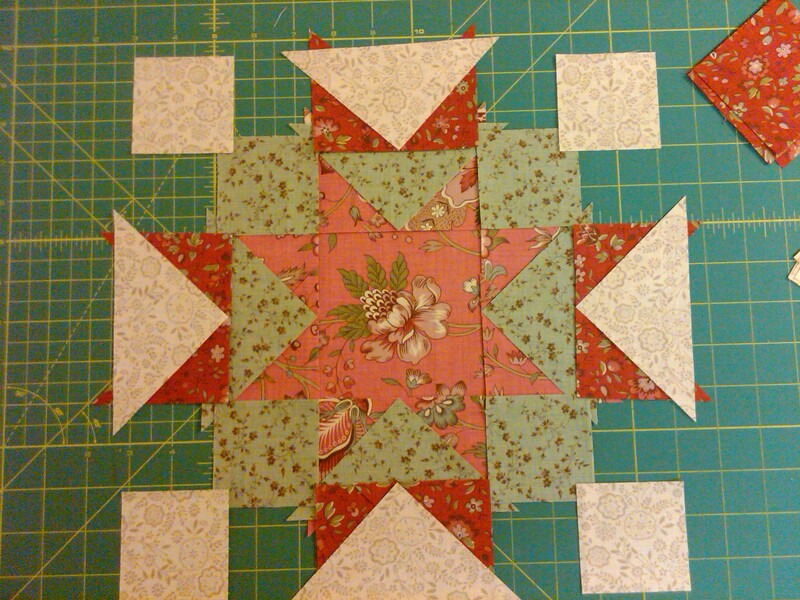 I moved on to the Alternate Block 1 for Blogger Girl’s BOM. 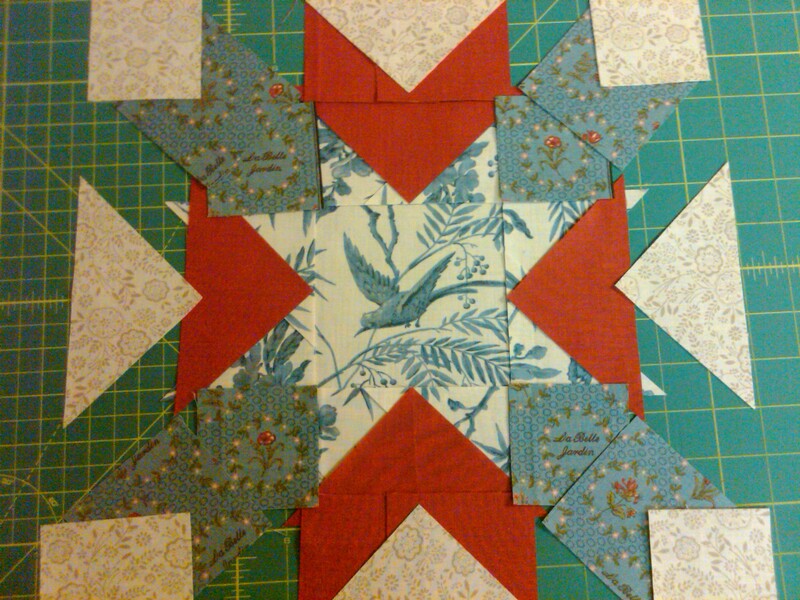 After selecting the fabrics which I thought would make a significant difference in the resulting block, I cut back into new fat 8th pieces. Turns out, I was just shy of being able to get my main background pieces out of what I had leftover from my first block. This will drive me nuts, especially since I can’t buy yardage in this collection until later this month. I just need a few more 3 inch blocks!! Dang it! Well, here’s the dry fit layout. Of course, until I do sew some of these pieces together, I can’t really demonstrate how awesome it is :). Try to imagine! And the colors in this picture are pretty bad since I’m working at night, under flourescent overhead lights. They will look decidedly different when they are all done and the colors are so much more wonderful that you can see in these pics. Home news update – they now tell us that we can come back after Monday. Still disinfecting everything, etc… Demolition appears to be done. Not sure when the building will start. Most of the floor is removed down to the lowest layer, which looks like some kind of tar paper was used for adhesive? The house is really, really old – so who knows what they are cleaning up now. Have a wonderful, quilt filled weekend! ← Dry Fit and Ready to get HOME! Beautiful! I love the fabrics you have chosen. Thanks Nicole! I appreciate the comment! Just gorgeous blocks ! 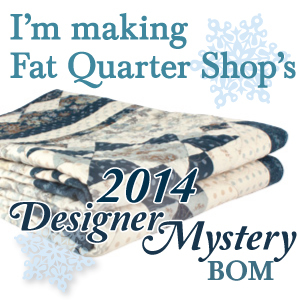 I have that same fabric I can;t wait to make a quilt too ! Thanks Sue! The yardage just arrived at FQS this weekend, so I was able to put in my order for the five yards of background fabric. I love the reds that French General comes out with!